We are the first supplier in North America to offer ahar papers (also known as muqahar) made specifically for Islamic calligraphy. Arabic calligraphy has been written ahar paper for more than 500 years. By the fourteenth century, four papermaking families settled in Rajasthan during the reign of Feroz Shah Tughlaq. These four families worked for the King’s court in Jaipur making paper from jute plants that grew on the banks of the river Saraswati. They made paper for official use, account books, calligraphy, the Holy Quran, and currency notes...Today there remains one traditional papermaking family in Sanganer. The Hussain Kagzis are well aware of their rich heritage. Mohammad Hussain Kagzi, the head of the household, made paper for decades out of a small setup in his home. His son Zakir Hussain has taken over the business and moved it out of their modest home to a unit a short distance away. Zakir Hussain is now joined by his two young sons in the effort. Together the three generations of this family work every day to produce handmade paper of high quality. You can read about the process of making this paper here. 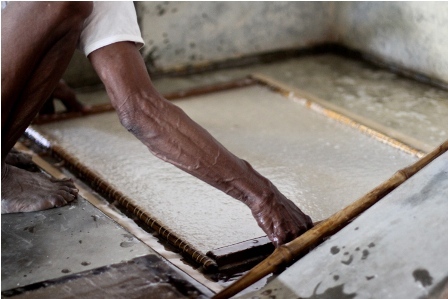 After the paper is made in Rajasthan they are coated with multiple coats of wheat starch and a sizing made from alum and egg whites. This creates a microscopic barrier between the paper fibers and the air, so ink doesn't penetrate the paper itself, and instead sits on the ahar. This allows for corrections and erasure. The paper is then burnished until it shines. 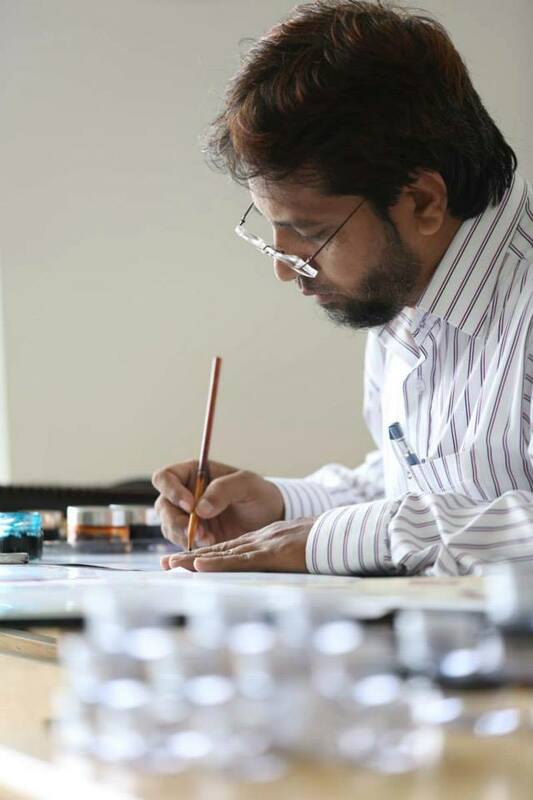 This lengthy process is undertaken by Muqtar Ahmed, the founder of the Institute of Indo-Islamic Art & Culture in Bangalore and India's only calligrapher with an Ijazah in calligraphy from both the Ottoman school and the Iranian Calligrapher's Association. These papers are thus prepared for calligraphy by calligraphers and are the only such papers available in America. Click on the papers for information on fiber make-up and close up pictures of the texture and grain. All papers are date-stamped on the back so you can determine proper aging. The following papers are all 50x80cm. A sheet of white 8.5x11 is placed to show tone and translucency of the papers. The following papers are 80 x 100cm. All of our papers ship ready to use, but if you are interested in preparing your own ahar, consider an agate burnisher to properly prepare your ahar papers. Our hand-crafted paper burnisher is the only one of its kind available in America. The 2" polished agate stone is set in ash. It is the primary tool for making paper ready for calligraphy. Without proper burnishing, ahar paper can never properly receive the pen. Most agate burnishers are meant for gilding, and thus have a contact area of a few millimeters, and are set on a stick which restricts the amount of pressure that can be achieved making them useless for paper preparation. For that reason we designed this two-handed setup for maximum downward pressure based on the design of Mohamed Zakariya Hoca's paper burnisher, a design tried and true for ahar preparation. We hand make these burnishers from scratch, grinding the polishing stone from raw materials. The stones are set in the handle They are then individually tested to make sure they are in perfect condition and ready to go.